It is the Holy Spirit. It is such a being who perplexed the followers of the Abrahamic religions for there is no consensus over the Holy Spirit’s status: if he is God or an angel or what? Each Abrahamic religion has its own conception of this unusual being. It is impossible to reconcile those conceptions given the considerable disparity among them. Let’s consider the nature of this being in the light of the Qur’an on the one hand and the Bible including the Old Testament and the New Testament on the other hand. In Islam, the Holy Spirit is Gabriel, who is an angel of God. He is sometimes mentioned by the name “Gabriel”, whereas he is sometimes referred to, inter alia, as “Holy Spirit”. He is exclusively named “Holy Spirit” to the exclusion of the other angels given his central role in the revelation of the Holy Scriptures and his support of the prophets of God and godly people. Ar-Razi followed by Ibn `Adil noted: “he was called ‘Spirit’ for he was created from God’s Spirit.” It is said that he is given this name “for he represents salvation for all creation in terms of judgment. So he is like a spirit which gives life.” It is also said “for he is wholly a spirit unlike the human beings who have both bodies and spirits.” He is called “trustworthy” for he was entrusted with the revelations conveyed to prophets and others. 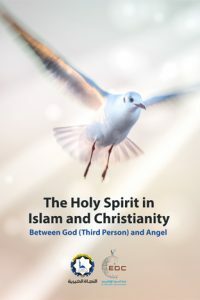 The evidence for Gabriel being “the Holy Spirit” is the frequent reference to him that it is he who brought down the Qur’an to Prophet Muhammad and that it is he who supports him along with the other prophets. Such are some of the qualities of the Holy Spirit as set out in the Qur’an.